I had an unbelievable time at the Palmer Track (Massachusetts) on Sunday. They changed the normal direction from counter clockwise to clockwise. I personally think it is better and faster. Anyway to explain what made me really happy, was the performance of my "Black Hawk". 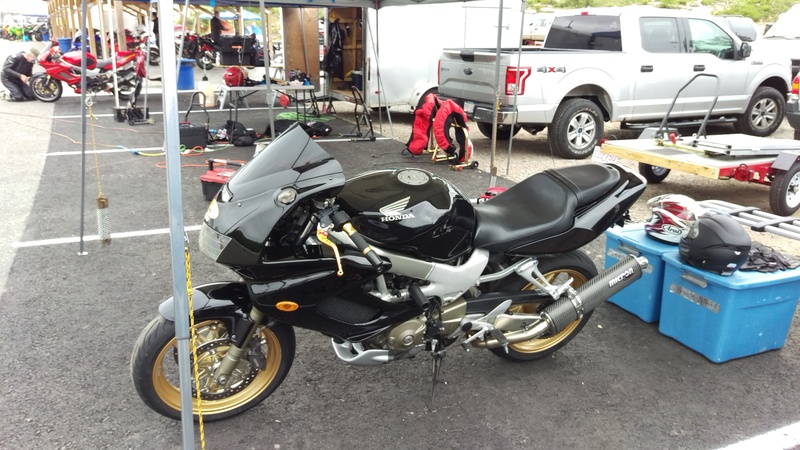 I have a 2011 Triumph Speed Triple, very nice bike, which I have put on the track and it is good, but I can put the Black Hawk into the corners faster and brake harder at the end of the straight much later. Now maybe I am more concerned that the Triumph cost me $10,000 and the Black Hawk just cost me $2,100, and I am not so scared of dropping the Black Hawk...It was the performance that I got out of the Hawk was so impressive. OK what has been done to my Black Hawk. Engine is stock with a K&N filter, not sure about any carb modifications, but the Hawk accelerates well, with out any pause or stumble....oh and it has Micron Exhaust system. Front Suspension has been upgraded with heavier springs (Because I am 225lbs with leathers) and a small drill hole for compression dampening.This was done thanks to the information from the "Hawk Forum". The rear is standard (what comes with the bike) but set on one down from full compression. The front brakes are standard, with EBC pads and stainless brake lines. Now I do have a second Hawk (which is my "Bird of Prey") which will be for the track, that is not completed yet and look forward to getting it there real soon. What is great is I can now compare the two for acceleration, brake modifications etc. I want my "Black Hawk" for the street. Back to the track...I got behind an instructor to copy his lines on the track and I never had problems staying with him. With the Triumph...maybe not so....but he could have been taking it easy, though we did pass a few people. The straight away the Hawk was impressive...the instructor probably had a smaller engine...but I felt I could have easily gone by him...but that does not show skill...go by him round the corners...that would be different. I lost what I was writing....I will Continue...not to sure about this auto save..? What I had to add to my speech was, knowing how well the bike performs, with basically standard equipment, why would you want to spend all that money on "up side down folks"....unless you live in Aussieland....and other modifications.....Just take the standard bike on the track, make the correct suspension modifications for your weight, make sure that all the parts are serviced (suspension linkage) good set of tires (Mitchelin Pillot 3 is what I use), EBC brake pads....and let her rip. Believe me, if you are a good rider, you will be amazed how you can pass those newer bikes with all the so called modern upgrades. I like it when I have something old which is faster and better handling...this reflects my age. Now if you are a full blown race guy...that my be different....I cannot wait to see how my "Bird of Prey" is on the track with the mods that I have done to it. Maybe I wasted a lot of money with all of my modifications on my "Bird of Prey"....but it will be good Pub (Bar) talk at the next track day. Talk to the Forum later. The red SH in the background, Who would that be? OK Eagle Eyes...I did talk to him and ask if he was on "The Forum"...sorry... no he was not. He would have been about my age and he had the Inverted folks off a Suzuki I think, with a six piston front brake caliper. He was in my group, but I did not see or pass him...I think.